Francesco Molinari, Jason Day, Brooks Koepka, Adam Scott and Louis Oosthuizen are in a five-way tie for the lead at 7-under for the tournament. Oosthuizen shot a 66 on Friday while Molinari and Day both had a 67. Then there is Tiger Woods, who is just one shot off the lead. Koepka and Bryson DeChambeau were the first-round leaders. Koepka wasn’t great in the second round, but made birdie on 18 to finish the round at 1-under and stay in a tie for the lead. DeChambeau struggled with a 75. Woods got on a roll on the back nine with birdies on 11, 14 and 15 and is now at 6-under for the tournament. It all adds up to a potentially entertaining weekend. Tiger Woods ran into the long leg of the law during an escape from the trees. As a gentle rain fell, Woods hit a low hook around the trees on the 14th hole and onto the green. He walked toward the fairway to see how the shot landed, when a Georgia Bureau of Investigation officer ran down a small slope to help control the spectators behind Woods. The officer lost his footing on the rain-slickened grass, sliding into Woods’ right foot, making him stumble. Woods flexed his ankle, then walked to the 14th green without a limp. His stride looked even better going to the cup after making a 15-foot birdie to reach 5-under, two shots off the lead. Ian Woosnam has called it quits at the Masters. The 61-year-old Welshman shot a 4-over 76 Friday to miss the cut and announced afterward this would be his final appearance at Augusta National as an active player. Woosnam won the Masters in 1991 on his fourth try and he’s been back every year since then except 2007. But he’s missed the cut in 17 of his last 18 appearances, and this marked the 11th year in a row he’s failed to make it to the weekend. Woosnam opened with an 80 and finished at 12-over 256. He beat only two other players in the field, fellow former champs Jose Maria Olazabal and Angel Cabrera, both of whom finished at 157. Play has resumed at the Masters after a delay due to thunderstorms in the area around Augusta National. Players stayed on the course during the 29-minute delay. Francesco Molinari, Jason Day and Brooks Koepka are the current leaders at 7-under. The second round of the Masters has been delayed because of thunderstorms in the area. 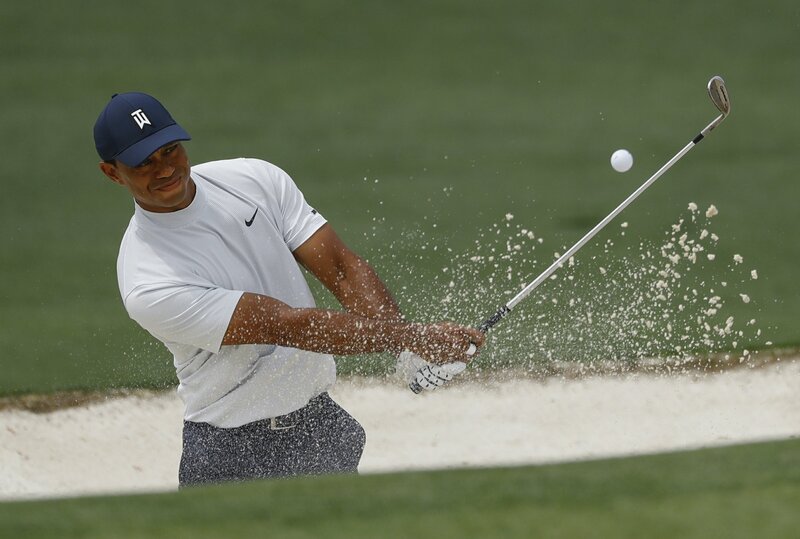 The break comes as Tiger Woods appeared to be heating up on the back nine of Augusta National. Woods made birdie on No. 9 and No. 11 and then hit his tee shot on the 155-yard par-3 No. 12 just five feet from the hole. Play was suspended a few moments after the shot. Alarms went off on the course and players were told to stay in place. Francesco Molinari, Jason Day and Brooks Koepka are tied for the lead at 7-under for the tournament. Molinari and Day both shot a 5-under 67 on Friday. Francesco Molinari and Jason Day each shot a 5-under 67 at the Masters to move into the lead at 7-under for the tournament. Molinari played a bogey-free second round Friday with three birdies on the front nine and two more on the back. The 36-year-old Italian is trying for his second major championship after winning the British Open last year. Day closed his round with three birdies over the final six holes. The 31-year-old Australian best finish at the Masters was when he tied for second in 2011. This is his ninth appearance at Augusta National. Bernhard Langer keeps shrugging off the date on his birth certificate. The 61-year-old German is heading to the weekend at the Masters after another age-defying performance. He shot an even-par 72 on Friday and is at 1-under 143 midway through the tournament. Of course, Langer’s showing really isn’t all that surprising. He is No. 1 on the Champions Tour, and this will be the fifth time in his last seven appearances that he’s made the cut, including an eighth-place finish in 2014 at age 56. The two-time Masters champion was struggling a bit in the second round, but he birdied three of the last five holes to get safely inside the cut line. The oldest player to make the cut was Tommy Aaron, who was 63 when he played on the weekend in 2000. Zach Johnson is one of the shorter hitters in golf. He took it to a new level with a shot that didn’t count, but was no less embarrassing. Johnson was going through a practice swing on the 13th tee when the tip of his driver hit the ball , which smacked into the tee marker and ricocheted to the left. Stunned, Johnson asked what he was supposed to do. The answer, in unison from his group, was the shot wasn’t intentional. Johnson was not saved by the new Rules of Golf. The incident would have had the same outcome last year. Patton Kizzire is going to make the cut at the Masters in his second appearance. The 33-year-old is also going into the weekend contending for the lead. Kizzire earned his first two PGA Tour wins last year but has never really been a factor at a major championship. He finished with a 2-under 70 on Friday and is currently two shots behind the leader Francesco Molinari. Molinari is at 4-under for the day and 6-under for the tournament. Ian Poulter and Brooks Koepka, who was one of Thursday’s co-leaders, are one shot back. Francesco Molinari has made a move up the leaderboard with three birdies on the front nine at Augusta National. The 36-year-old Italian and last year’s British Open winner made birdies on Nos. 3, 8 and 9 on Friday to pull into a second-place tie with Phil Mickelson at 5-under. Bryson DeChambeau still has a two-shot lead at 7-under for the tournament. He was 1-under through eight holes in the second round. Brooks Koepka, who was the co-leader with DeChambeau after Thursday, is 2-over for the day and now three shots back. Bryson DeChambeau isn’t having much trouble navigating the soggy course at Augusta National early in the second round of the Masters. Brooks Koepka, however, ran into some early trouble. The 28-year-old DeChambeau made birdie on No. 2 and is now alone atop the leaderboard at 7-under. Koepka, who came into Friday tied with DeChambeau in first place, made birdie on his first hole but then made double bogey on No. 2 after hitting his drive into the trees and having to take a drop. Phil Mickelson is one shot back at 6-under after a birdie on No. 2. Koepka is in third place, two shots back. The leaders heading into the second round at the Masters are all set to tee off in the next 30 minutes on what’s expected to be a very soft course after steady morning rain. The rain tapered off by midmorning Friday and the sun even started to occasionally peek through the clouds at Augusta National. Bryson DeChambeau and Dustin Johnson are in the 10:42 a.m. group. Phil Mickelson tees off at 10:53 a.m. and Brooks Koepka at 11:04 a.m.
DeChambeau and Koepka are at 6-under. Mickelson is one shot behind and Johnson is two shots back. Chances of Augusta National getting firm and fast for the weekend at the Masters are looking as dreary as the morning sky. Light rain was falling in the hour before the second round was to begin, and the course figures to be even softer than it was in the opening round when Brooks Koepka and Bryson DeChambeau each opened with a 6-under 66. They are among the early starters for the second round. The top five players on the leaderboard — Phil Mickelson, Dustin Johnson and Ian Poulter are right behind — play in the morning. Tiger Woods, who was four shots behind, is among the last to tee off.